Sometimes we need another perspective on things. Ever find yourself sitting on a mountain top, a high hill, or making looking down from a plane, and you notice a grander point of view? There's something about elevation that provides a larger perspective, something that often helps us with our smaller concerns. From whence do we gain our inspiration? From the clouds? Sometimes. The notion that there exists a greater self is almost universal. There is an inner intuition regarding a consciousness or awareness that has a reach beyond our eyes, a wisdom beyond our understanding. If we could only get out of our own way! Our habit thoughts block the passage of the inspirational flow. How can we reach the mountain top of our awareness? Dreams have been perhaps the most famous of channels for inspiration. One advantage they have is that we are asleep when the dreams bring forth inspirations and it is difficult for us to block their appearance. But what about deliberate, intentional attempts to access the inspirational domain? Concoctions, dances, trances -- all of these methods and more have been tried in the attempt to sedate the talkative ego so that the more subtle inspirational realm can be accessed. And once prepared, how do these inspirations appear? In what medium do they feel most at home? For some, visionary experiences are the preferred theater of inspiration. For others, art work. Others find it through their mouths, talking or singing out the flow of inspiration. And a significant number of folks use writing to draw out the inspiration and record it simultaneously. Some form of spontaneous writing, material emanating directly from the unconscious mind of the writer and being recorded as it appears, has provided mankind with some of its most influential sources of inspiration. I'm thinking of such classics as The Koran, The Prophet, The Urantia Book, Johnathan Livingston Seagull, and most recently, Conversations with God. In my book, Edgar Cayce on Channeling Your Higher Self, I describe a general rubric for bringing forth inspiration from one's higher self: It is to get tuned in, and then let go. What do we mean by being tuned in? I'm referring to the preparation stage. It begins with setting an intention. What kind of inspiration is being sought, and for what purpose? Tuning in then continues by some activity, ritual performance, or other type of mental preparation. Meditation, for example, might begin with a brief prayer that states the intention for seeking inspiration, and then the person would begin to focus on some affirmation that would help to relax thought and induce an empathic alignment with some "uplifting feeling," that would open the passage of inspiration. The writer would then beging to write while in that meditative state, conscious of what is being written, but not inventing the writing -- watching it unfold instead. I have practiced this type of writing for many purposes, and have explored many forms of preparation. I find inspirational writing to be an invaluable resource and avenue of both discovery and expression. I want to introduce you to two new books that provide very effective methods for learning and developing this skill. 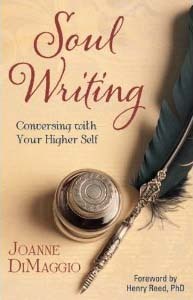 The first is Soul Writing: Conversing with your Higher Self, by Joanne DiMaggio. This book is a good resource for learning about the history of this medium and the various types of literature it has produced. It is worth noting that many of these works have had a tremendous influence in history -- a testament to the power of this approach to inspiration and guidance. The author has a long personal history of using inspirational writing for her own purposes. She received her Master's Degree in Transpersonal Studies by doing a study involving teaching people how to give birth to inspirational writing, and her book shows evidence of all she's learned teaching others how to get "into the zone," as some call it. This applied aspect of her book is a quite valuable contribution to the study of how this skill can be taught. From her work with others, she is sensitive to the difficulties folks have in getting past their internal noise, or learning how to disregard it in favor of more subtle trains of thought. Thus her book has a lot of instruction, guidance and hand holding about the preparation stage. To become a conscious channel of inspiration requires of us two, usually contradictory, tasks: first, to be inwardly alert and aware, and two, to be completely relaxed and in a state of letting go. In my own work, I've found an amusing way for folks to realize the challenge and its paradoxical simplicity. What I do is to ask folks to notice their breathing. After a few moments of silence, I ask for a show of hands from folks who, upon noticing their breathing, did something to modify or improve it. Most hands go up. I remind folks that I asked only to notice the breathing, not to touch or change it, but that we find it so hard to be inwardly attentive like that without inserting ourselves into it. Even though we know breathing can go on automatically without our help, that it is a part of nature; even though we realize that obvious truth, the fact of the matter is, when we confront our breathing, it is hard to let it go. It requires a certain patient practice to discover that fine balance of alert awareness combined with a relaxed attitude: "I can be aware of my breathing and let it be, and I'm learning how to let go and let inspiration breathe me." DiMaggio's approach to this challenge is compassionate, supportive, and instructive. One of the side benefits of practicing inspirational writing, or any form of improvised creativity that is harnessed for an intentional purpose, is that it builds trust in oneself. We are so trained to look outwardly for information, it comes as a surprise to some folks to discover just how wise they already are. While some proponents of spontaneous writing focus on the magical quality of it, DiMaggio is mindful of the general spiritual benefit and shapes her supportive guidance accordingly. Other writers may suggest tricks that can evade the interfering ego, but DiMaggio realizes the value of training the ego in becoming the silent witness. She realizes the value simply in developing the inspirational mode, independent of any product that might ensue. She frequently reminds us of the importance and value of being in communion with our souls, with our inner desires and motivations, our deepest thoughts and notions. For her, inspirational writing is not so much for show and tell as it is for our own growth, and for our ongoing need to be connected to the source of life, which is within us. DiMaggio's book is perhaps the best source available on this fine art of applied spirituality for she combines both a great instructional manual with the Yogi's sense of spiritual purpose that understands why the practice itself is the goal. 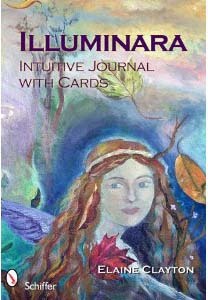 Whereas DiMaggio's book might be the best resource for learning inspirational writing, I find Illuminara: Intuitive Journal with Cards to be perhaps the most unique approach to it. The author, Elaine Clayton, is a professional artist, book illustrator, and intuitive consultant. Her personal skills thus embrace both verbal and imagistic forms of improvisation leading to inspiration. But while DiMaggio was growing up using journal writing to keep herself company and connected with Source, Clayton was using doodles. She has made videos of her doodle process and you can see them on her website, Illuminara.com. Clayton's Illuminara set is both book and cards. At first, one is tempted to place this product on the shelf with all the other "Tarot" cards and other divinatory systems. There is a divinatory aspect to Clayton's cards, which we'll discuss momentarily, as it adds another dimension to the inspirational writing arrangement. Actually, however, what Clayton intends is not so much a divinatory tool, as a support structure for inspirational writing. To use looking at pictures as the starting point for inspirational writing is a unique approach that I've not encountered elsewhere, and some experimentation with it has proven its surprising value. The written part is a booklet that explains how to use the picture cards. Once the process is understood from these instructions, it is the cards themselves that provide the action. Right away, here is one difference between the Illuminara cards and divinatory decks: in divinatory decks, there is a manual that gives interpretations for each card. The Illuminara cards do not have such a manual, for the intent is that the reader herself will respond to the card and provide the necessary meaning -- through inspirational writing! I need to describe the picture cards a bit to better explain the process and why this product is so unique. There are 40 cards, each one is an illustration by Clayton. There are images of everyday scenes and fantasy images. Clayton used a variety of of artistic styles and art media for the pictures. Some are quite straightforward in their representation, while others are reminiscent of the freedom of Chagall's scenes. The Illuminara process begins with you deciding upon an intent -- what is your concern, your purpose for engaging in this process? Perhaps you are troubled by something and wish a creative perspective, then that would be your intent. Given that intent, you then pick a random card from the pile. When you turn it over to look at it, you do so with the expectation that you are going to see something in the picture that will trigger some thought related to your intent. Of course, when you actually do turn the picture over and look at the picture card, there is a moment of surprise. What Clayton suggests is that you look at the card and begin writing about what you see in the picture and then let the writing continue to see where it takes you. Here enters both an element of synchronicity (from the card choice) as well as the mystery surrounding how it is that we see what we see in something that appears before us. When I first looked at the Illuminara picture cards, I was reminded of the Thematic Apperception Test, developed decades ago by Henry Murray. Intended as an alternative to the old inkblot test, the Rorschach. The T.A.T. (as it was usually called) was a series of black and white picture cards displaying realistic scenes that were nevertheless somewhat ambiguous as to what folks might be feeling and so on. The person being "tested" was to make up stories to go along with these pictures. The idea behind this "projective test" was that the person's unconscious stirrings would reveal themselves in the stories the person would invent for these pictures. When I viewed the Illuminara cards from the perspective of my past association with the T.A.T. cards, I wondered at how they might stimulate inspiration rather than reflection. The difference, of course, lies with the intent, and here, the intent has a practical value, to connect the people with their own natural intuition regarding issues in life. The Illuminara cards are not intended to help a third part diagnose what's on the mind of a client; instead, the cards are intended to promote self-empowered intuition, to demonstrate that we have within us what we need to provide our own connection to inspiration and guidance. I'm all for that and wanted to experience it in action. When I began to use the cards, I chose as my first "question," how I could best make a connection with the cards given my background. The card I pulled was what looks like an oil painting of colorful clouds in a blue sky. The sky fills most of the picture. The land is low, a small house is visible. Along the bottom of the picture is a line of telephone poles. It might be a scene from the prairie. My first reaction is to see the clouds and recall an experiment with children doing creative writing after laying on the ground and looking up at the sky and clouds for a few minutes and how inspiring that was. As I continue to write about my own cloud gazing and ideas that come in my outdoor bathtub, the depiction of the telephone wires, appearing and disappearing as they travel between poles reminded me of the intermittent nature of the "connection," even as I write. I realize, also, that I'm being affected by the style of the painting, not just the content. One might wonder if 40 cards are sufficient to stimulate us toward inner wisdom concerning the infinite number of issues life presents. Well, a traditional card deck has 52 cards, a number that has significance, and is not much greater than 40, another number with some spiritual connotations. Yet I come to realize that 40 is the number of pictures. But there must be at least 20 different styles of representation, which adds even more variability. Both the artistic style and the content of the pictures are operative to stimulate insight. I've had a lot of experience with inspirational writing. I've mostly prepared by meditating. That is the approach I use most when my intent is to use the method to create some writing that I can incorporate into my work. There are other times when I'm more experimental. Moving to music is a favored preparation, as well as chanting. I was curious to see how the Illuminara process would work with its more subtle, yet in-your-face, type of preparation and stimulation. Can an image set you off to conduct inspirational writing? I've found that the answer is yes! This discovery suggests what makes Clayton's approach to inspirational writing so unique: it uses a visual stimulus! We're already familiar with using synchronicity as a prompt to our intuition. Manuals accompanying Tarot decks often suggest looking at the details in the card for more ideas, yet the theoretical, archetypal structure underlying the Tarot dominates the interpretive process. In Clayton's cards, it's all visual. I worked the Illluminara process again to gain some idea about the specific value of the visual stimulus to inspirational writing. This time, the card that "came to me," was a picture of a man playing a cello. There's a hint of another musical instrument being handled behind him. I begin my inspirational writing, "playing around, the music is playing, music of the spheres, music which creates the patterns of life, these things are so well integrated, we cannot think of all the ways in which life is connected to itself, and so a picture is worth a thousand words. As I prepare myself for inspiration, I may release my breathing, I may begin to cultivate feelings of peace, beauty, joy, truth. I "reach" for that place from which inspiration flows. I know the feeling. Seeing the cello I'm reminded of the free flow of jazz music and the soulfulness that gave rise to it. I can almost "see" the notes spurting out like fireworks of colorful sound. The eyes naturally explore and while they do, I'm motivated by my intent, my curiosity, my receptivity to new ideas, new understandings, and the picture invites my eyes to move in unexpected ways and I am surprised that I'm guided to notice things that bring ideas to me. I find myself wondering what might be a universal image that would inspire all that is the best within. Yet that image might be boring to another. I understand now that these pictures become very personal places,where what you see is who you are, and that is where the intuition comes in to play." I could go on and on, but this one session with Illuminara inspired me about the value of the image as a starting point for inspirational writing, a method I had not previously considered. To me, this makes the Illuminara product quite thrilling. I realize that my years of practice makes the process immediately accessible to me. If I were a newcomer to the process, I would want to have the DiMaggio book to help me learn the art. And I know me, that I would always want to have available an open ended approach to inspirational writing, and DiMaggio's book would be my Bible. But I also know me, that I always want something that takes me to new directions I'd never consider myself. That's a hard tool to find. But I've found it in Illuminara, as it has led to some surprising sessions of inspirational writing. There's really no need to compare the two, as each speaks to a different sensibility. I want both approaches in my repertoire. I'm so pleased that there exist such accessible tools for both. I recommend them.